“The labour market should be able to trust that the government minister or the government keep their promises. That is the key to stability in the labour market,” he says. 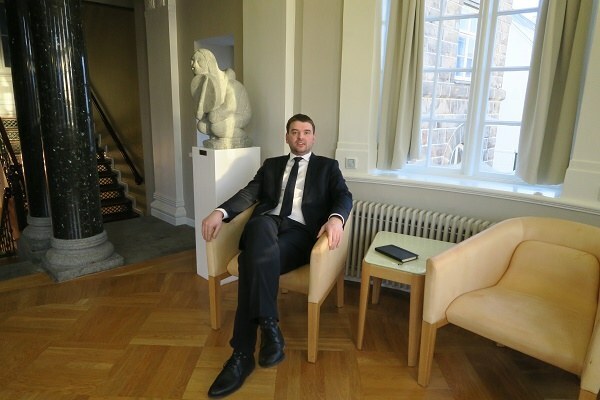 Ásmundur Einar Daðason is a classic welfare politician who wants to improve the situation for families with children and eradicate poverty in Iceland. Ásmundur Einar is only 35 years old. 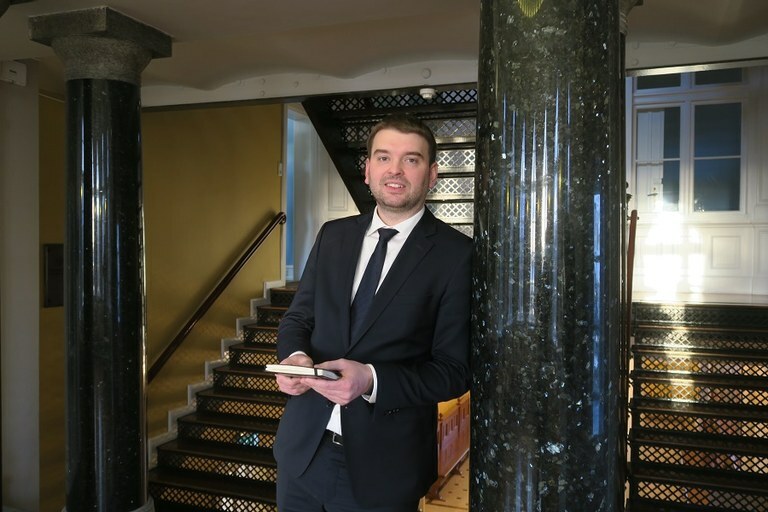 Yet he has been a member of the Icelandic parliament, the Allting, since 2009 – first for the Left-Green Movement (VG), later for the centrist Progressive Party. He is now a member of a government led by his old party VG, and Prime Minister Katrín Jakobsdóttir. Ásmundur Einar explains that he decided to leave VG after the economic crisis in Iceland nearly ten years ago. Back then he felt that VG was too far to the left. At the time he was the leader of an organisation called Heimssýn, which gathered Iceland’s EU opponents. “I have always been against EU membership for Iceland. I have not changed my stance on that,” he explains. On that particular point, there are no disagreements with Katrín Jakobsdóttir, who is also an EU opponent. His to-do list is long. Poverty in Iceland is to be mapped before the government decides what to do with that problem, and how to do it. The government minister believes it is important to improve the welfare system, especially for families with children through child allowances, but also the health system and the country’s social safety net. Ásmundur Einar is planning changes to parental leave, both in order to strengthen gender equality and to support families. The plan is to increase parents’ allowances and to allow new parents to stay at home for longer. He does not know the exact details yet, but he will approach this in his discussions with the labour market parties in the run-up to the 2018-2019 collective agreement. Ásmundur Einar is also worried that more young people will become inactive in the labour market. Increasing numbers struggle with mental issues, and risk falling outside. Society is changing fast, parents have challenging jobs and things are speeding up. New technologies impact on social developments. Ásmundur Einar believes young people are being overrun by new technology and different impressions, some of them become ill as a result. He thinks children need more support in the new society, and parents need help to be able to look after their children better. Labour market policies will play a key role in Iceland’s economic stability over the coming two years. The way things develop can become central both for the government’s political survival and people’s quality of living. In order to settle the collective agreement, the government is happy to suggest various measures. Or legislation. The minister also says he has already met the labour market parties during his first week in office. He intends to keep up the good contact while also strengthening trust between the ministry, the government and the parties. The labour market should be able to trust that the minister or the government keep their promises. That is the key to a stable labour market, he says. “What happens next is a different matter. Here at the ministry we look after social insurance issues, housing issues, welfare issues and labour market issues in general. Many issues can influence how the labour market develops, not least housings market legislation,” he says. Iceland has attracted international attention because of its new legislation on an equal pay standard which aims to make sure women and men are paid the same for doing the same work. The ministry will soon start preparations for the implementation of the equal pay standard. In the coming years the standard will be introduced in Iceland’s largest companies, but smaller companies will also have to follow the standard after a while. Iceland has an unexplained gender pay gap of five to seven percent, despite efforts to get rid of it. Ásmundur Einar explains that everyone in Iceland believe it is important that both sexes are paid equally for equal work. According to him the equal pay standard should become obligatory. If not, companies will remain passive and fail to adopt the standard. “This is important, not only for the political image but also for gender equality and society as a whole. We believe that strengthening gender equality will strengthen the economy too,” he says. He has previously been active on a Nordic level. The Nordic cooperation is important, he believes, and according to him Iceland has always held that cooperation in high esteem – both when it comes to working life, sport and culture. “As a member of the Nordic Council of Ministers, I got to know about the Nordic cooperation,” he says. Ásmundur Einar has relatives in Norway. He used to live in Stavanger and speaks fluent Norwegian. The Minister of Social Affairs studied agriculture and comes from a farming background via his father’s farm in north-western Iceland, which he used to visit during his childhood summers. As a child he moved around with his mother, but always spent summers with his father in the countryside. “I have always been very active in various organisations too. I became politically active at an early age. I have always kept in touch with my roots,” says Ásmundur Einar Daðason. Gender equality is important to Ásmundur Einar. He is the father of three daughters, and the debate about men and women’s different opportunities resonates with him. It should not be the case that your sons have better opportunities in life than your daughters, he believes. “If I had three sons, they would probably have exactly the same opportunities as everybody else. But our daughters do not have the exact same opportunities as boys do, and that is something we must address,” says Ásmundur Einar. The young government minister is happy in his role of leading the way for society’s development. He underlines that he is an ordinary bloke who does the clothes washing at home. He does not like to be put on a pedestal. He just wants to be equal to everybody else. But he likes being able to get engaged and to lead the development. A digger operator when I was a young boy, later I wanted to be a fish farmer or fish biologist. Two years later I wanted to be agriculture minister. For a while I wanted to be an actor. I use my phone the most, but is it my favourite tool? I don’t have a favourite tool in the office. My advantage is also my disadvantage. I work fast, but I also find it difficult when something takes a long time. I sometimes find it difficult to sit still for longer periods of time. To be perfectly honest, I have never been a big book lover. I sometimes keep a book next to my bed, but I have read nothing but work-related reports and articles since becoming a government minister – except for books I have read to my two year old daughter. Last night I read Gunilla Wolde's book, Thomas Bakes. We read the entire book before turning out the lights and she fell asleep. Born in Reykjavik in 1982. Education: Agriculturist from the Agricultural University of Iceland. B.Sc. in agronomy. Elected MP in 2009 for the Left-Green Movement (VG). Today he is a member of the centrist Progressive Party, and represents them in government. Minister of Social Affairs and Equality since 30 November 2017.